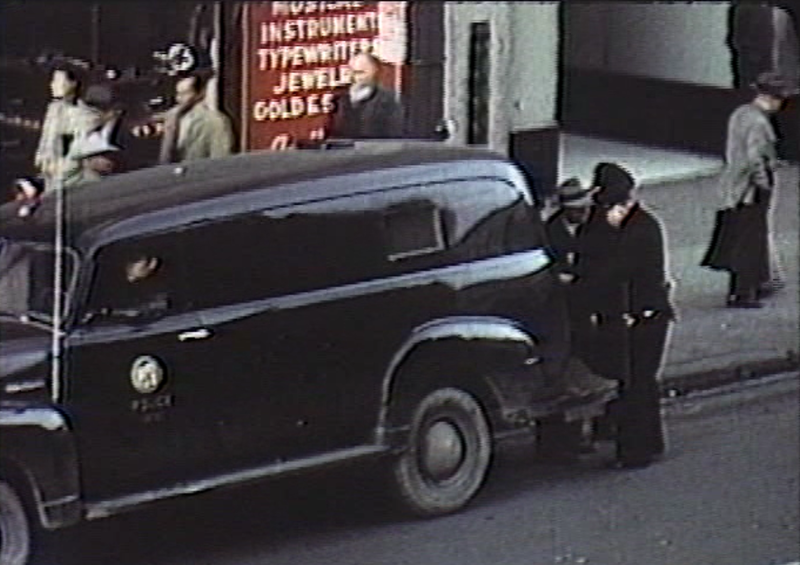 In anticipation of the October 20 rooftop screening of the Union Rescue Mission’s 1949 film Of Scrap & Steel, in this post we’ll examine two stills from the film as a window to understanding how two mid-century Los Angeles County law enforcement agencies dealt with the task of enforcing statutes concerning transients. The first of the two film stills on the left was shot on Main Street in front of the Fun Palace at 243 South Main. The second still was shot on 2nd Street, just east of Main. The first, Fun Palace still shows one of the notorious LAPD “Black Maria” vans, with an officer shuffling an old “rummy” into the back. This scenario was common at the time. Arrest was the primary tool used by the LAPD for dealing with transients within the borders of Skid Row. In future blog posts we will delve further into the history of vagrancy statutes in Los Angeles, the evolution of the City’s Public Policy on the topic, and the role of the LAPD as an enforcing agency. It is the second still showing an officer in what appears to be a dark brown uniform which is of particular interest. 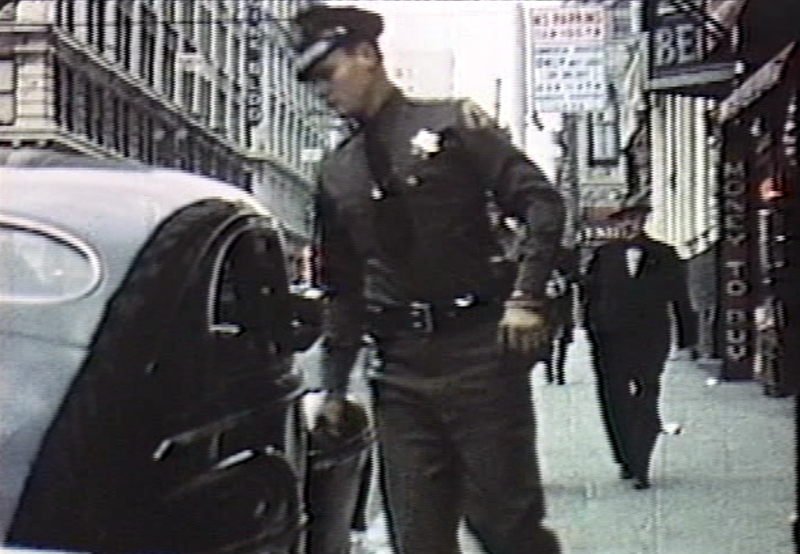 The nitrate print of the film was so badly damaged that when it was digitized, the Los Angeles County Sheriff’s Department’s traditional green uniform appears as dark brown, so it is unclear what type of officer is patrolling Skid Row in search of drunks to roust. Closer observation reveals the familiar LASD deputy’s badge on the left breast. But what are LASD deputies doing on East 6th Street, in an area clearly within the jurisdiction of the LAPD? What the film does not show is that just moments before the deputies pulled up to the curb and hustled the transient into their car, an LA County Health Department official issued this man with a vagrancy citation. Working in tandem with the Health Department, LASD deputies would sweep through Skid Row, arresting anyone who had received such a citation and lacked the capacity to immediately flee the scene. Interestingly, this is the same method which would be used on larger scale social control operations like the clearing of the residential community Chavez Ravine in the early 1960s. While we now understand how it is that LASD deputies might make arrests along Skid Row, within the boundaries of the LAPD, the motivation for such arrests still needs clarification. When the Hall of Justice was opened in 1925, the LASD was put in charge of running the Hall’s jail. Because prisoners in the Hall of Justice were put to work on road crews and doing other County work, it was in the interest of the powers that be to maintain at all times a capacity population. The routine arrest captured in the second still was one of the ways in which that population was maintained. When this man sobered up, he would be put to work. In anticipation of this weekend’s free walking tour The Flâneur & The City: Victorian Los Angeles, and the October 20 free screening of the Union Rescue Mission’s film Of Scrap & Steel, in this post we explore the Union Rescue Mission’s Victory Service Club at 220 South Main, which opened in August of 1942 in the newly-purchased northern part of the Swanfeldt Building. The URM had purchased the southern portion of the Swanfeldt Building in 1926, after having their original 1896 headquarters seized by imminent domain for the construction of City Hall. The top photo on the right, which is a still from Of Scrap & Steel, shows the Fun Palace at 243 South Main. The second photo, not a still from the film, shows the URM’s Victory Service Club, across the street at 220 South Main. 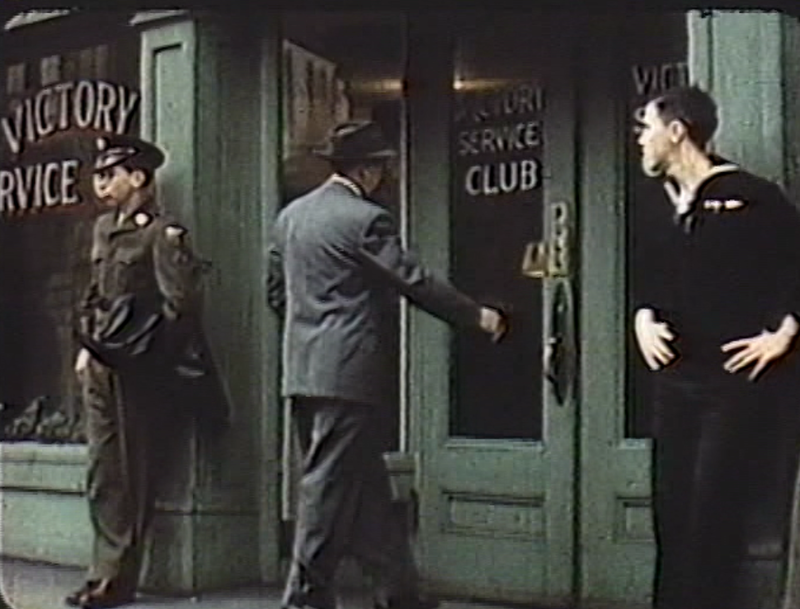 The third photo, another still from the film, shows the Victory Café, which was just a few doors south of the Fun Palace on the west side of Main Street. At first glance, the missionary-run Victory Service Club could not be more different from the penny arcade and its neighboring café, but a closer look reveals how these longtime neighbors coexisted and were shaped by each other. 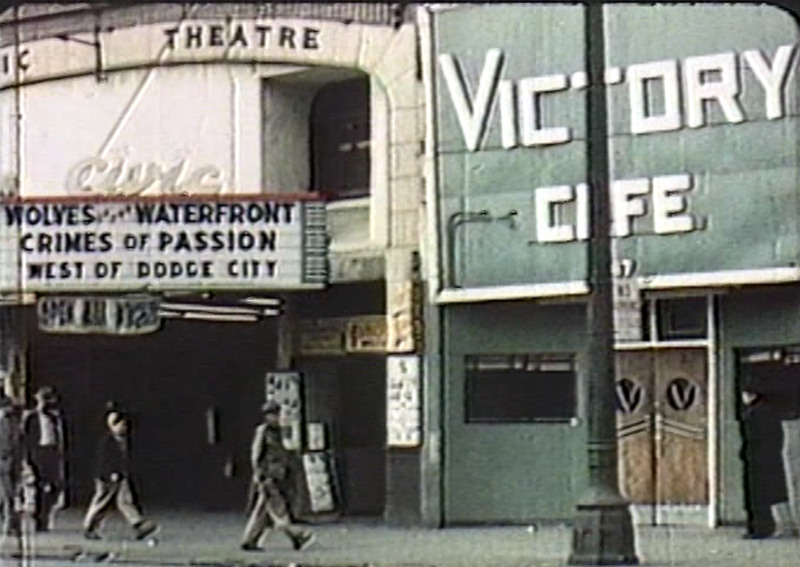 The Fun Palace, run by veteran showman and coin-machine operator Fred McKee, was incorporated under the name Victory Amusements, which suggests a business connection to the Victory Café. 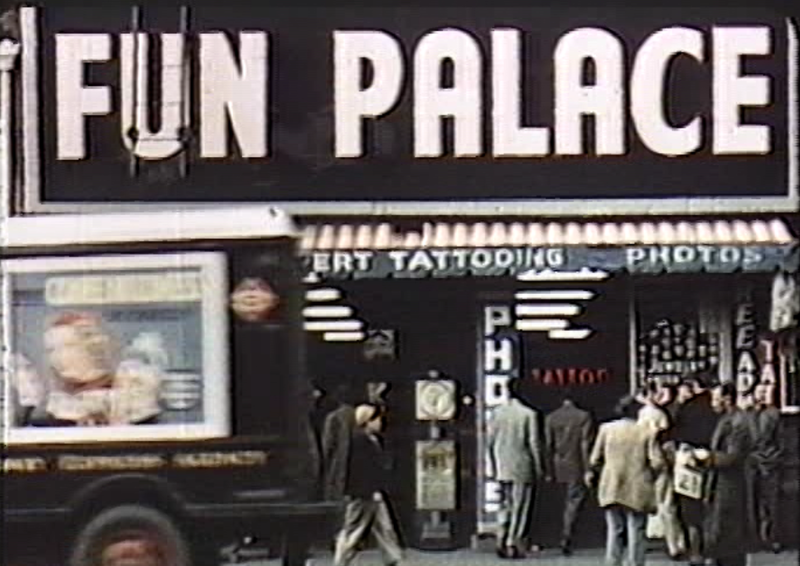 Research reveals that the Fun Palace played a vital role in the leisure time activity of servicemen on leave in Los Angeles during WWII. Men in uniform who were seen hanging around the machines without playing were quickly identified by staff and given 50¢ in pennies. This was a wise investment in good will, and the establishment received a healthy return on its investment. Soon after the war began, Fred McKee determined that servicemen up from their bases for a 24- or 48-hour “R&R” leave needed more than just a bright, clean place to test their skill and try their luck. They also needed somewhere to bed down for the night, and a welcoming place where they could fortify their souls in the face of the tremendous job ahead of them. To that end, Fred maintained a list of private homes and religious organizations which offered free accommodations to servicemen, and the Fun Palace became known as a destination for men on leave seeking direction in Los Angeles. 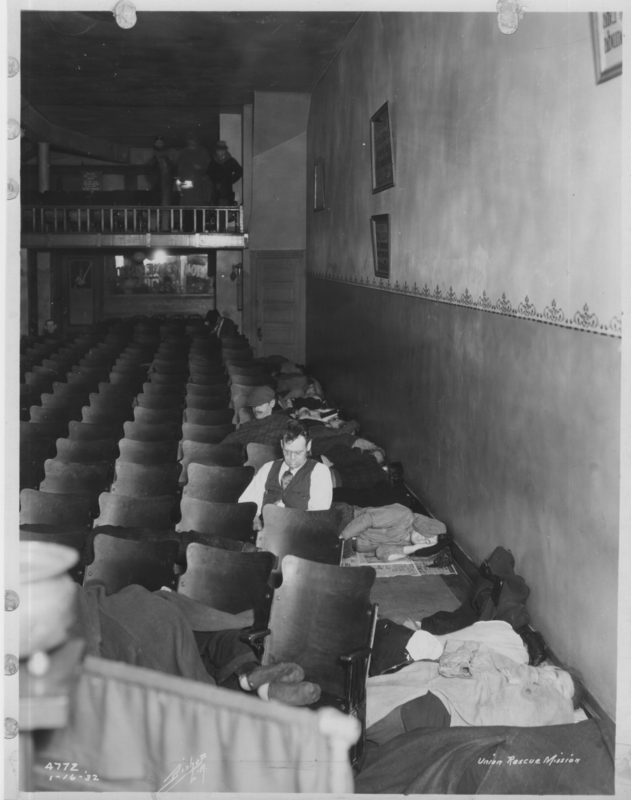 In March 1942, the URM’s Board of Directors allocated the necessary funds to purchase the northern half of the Swanfeldt Building and open a center whose objective would be “a day and night ministry seeking for the men in uniform that vital experience of Christian realities” which the URM described by the phrase “response.” This venue would stand in stark contrast to the bars, tattoo parlors, strip clubs and amusement arcades which provided more earthly amusements along Main Street. In August 1942 the Victory Service Club opened its doors under the direction of Rev. Robert Bolin Hubert Mitchell. He brought in directly under him the young Rev. Don Spencer McCrossan. Don McCrossan would shepherd the Victory Service Club through WWII, Korea and the Vietnam War. By his retirement in 1975, the club had played host to more than three million servicemen, and provided an unexpected oasis of comfort on Main Street which deserves to be remembered. Los Angeles in 1913 was fast becoming a modern metropolis. The streets were a crazy quilt of traffic comprised of pedestrians, horses, bicycles, and automobiles. It had grown from a small pueblo of fewer than 100 residents into a city of approximately 400,000 souls – many of them in need of saving. The Union Rescue Mission had been leading people to God in the City of the Angels since 1891. 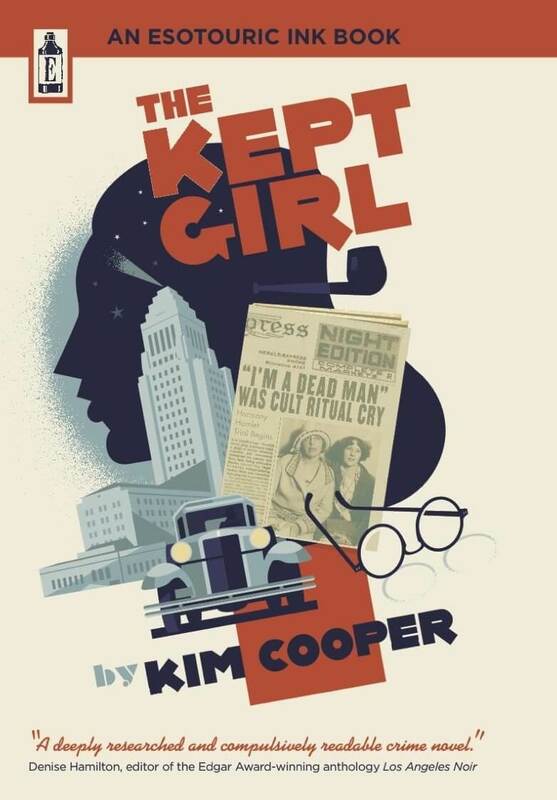 One of the tarnished souls wandering the streets of Los Angeles on the evening of October 20, 1913 wasn’t a resident, he was a visitor to the city on a mission of his own – to rob a Southern Pacific Railroad train! The man’s name was Bill Stiles, and he was in Los Angeles with two cronies making plans for a train robbery. When he’d left his downtown hotel to roam the streets of the city he had left all of the tools of his trade, guns, high explosives, and “soup” (nitroglycerin) in a suitcase in his room. As he was strolling along Main Street he spied a cop walking in his direction. Bill had been feeling uneasy about the upcoming robbery and seeing the cop did nothing to calm his nerves. He didn’t know if he was being shadowed by the law or if it was chance, but he wasn’t about to risk his freedom – particularly since he hadn’t been out of prison for very long. He had come upon the Union Rescue Mission at 145 North Main Street and figured it was as good a place as any to shake his possible pursuer. Bill grabbed a seat near the front of the room, seeking anonymity in the crowd of worshippers. Stiles would describe the evening later saying: “I did not hear much of the service, for my mind was upon the work for the next day.” In fact his mind was so occupied with the next day’s work that he was just about to get up and head back to his hotel room when one of the Mission’s workers approached him and asked him to give himself up to God. Stiles told the evangelist who had invited him into the fold that he didn’t believe in God because of the horrible life he’d lived so far. As he stood up to walk out of the Mission he realized that his legs wouldn’t move! He found himself fastened to the floor by, as he would later state, “a power not of this earth”. Bill may not have known it then, but he’d just been saved. Despite an evening of tears, prayer and confession, Stiles returned to his hotel room that night. The next day he informed his co-conspirators that he’d found God and that he was finished with his life of crime. His friends told him that he was crazy and they went off to meet their own fates – both were gunned down in separate holdups. It was barely dawn on the day after he’d cut his old life loose forever when Bill arrived at the Union Rescue Mission. The front door was locked, so Bill began tapping on a window until Mother Benton let him in. Mother Benton was surprised to have a visitor at such an early hour, but she was even more shocked when Stiles confessed to her that the suitcase he carried with him was filled with “soup”. With Stiles in agreement Mother Benton called the cops to surrender the explosives. When the officers arrived they asked a few questions then they carried off the suitcase, leaving Stiles uncharged. Mother Benton was stunned by the contents of Bill’s suitcase, but if she’d known then that she was talking to a man who had been considered deceased for nearly 40 years she may have collapsed on the spot. The man in Los Angeles who was calling himself Bill Stiles was at the center of a historical controversy that continues to this day. Bill Stiles was the name of one of the bandits who had been shot down during a raid conducted by the Jesse James- Cole Younger gang on a Northfield, Minnesota bank in 1876. And the man in Los Angeles was claiming to be the Bill Stiles that had ridden with the gang to Northfield! The identity of the dead man in Minnesota has been the cause of controversy since the day of the robbery. So, too, has the actual number of bandits involved in the raid. Was there a ninth man waiting outside of town? And if there was a ninth man, who was he? Could the man in Los Angeles be an imposter with nothing more than a good tale? The speculation and controversy over the identity of the Los Angeles Bill Stiles (dead bandit, or live Christian convert) has continued unabated for 135 years everywhere but at the Union Rescue Mission. Once the Bill Stiles who presented himself at the Mission all those years ago found a faith in God, he found the acceptance of the Mission’s congregants who had no incentive to disbelieve him. In fact everyone at the mission felt that “a wonderful change had been worked in the heart of Bill Stiles”. In the end perhaps it’s not important to know whether the Bill Stiles in Los Angeles actually rode with Jesse James and Cole Younger or not. A man who carried around a suitcase filled with guns and nitroglycerin would be considered an outlaw by anyone’s measure, and he would certainly be viewed as a man whose soul needed saving. Whatever had held Bill Stiles’ feet to the floor at the Union Rescue Mission on that October night in 1913 was true and good, for it was said of him that he was “our faithful night watchman, alert and watching while his fellows sleep, much as he used to, only for a different purpose”. 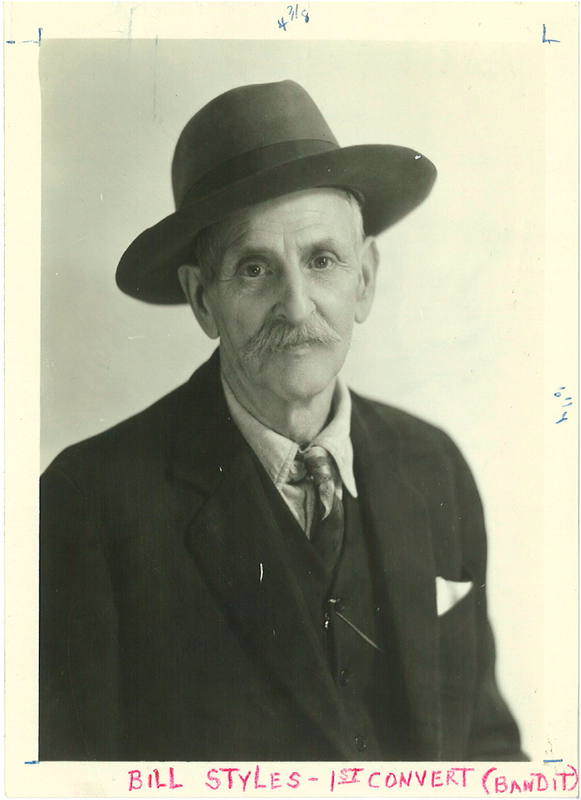 Bill Stiles passed away on August 16, 1939. As for the veracity of Bill’s story of his outlaw days – that’s between the old cowboy and his maker. Note: If you’d like to learn more about Bill Stiles and the ninth man controversy, I suggest that you read The Jesse James Northfield Raid : Confessions of the Ninth Man by John Koblas. It was on the evening of October 30, 1913, in the Union Rescue Mission, 145 North Main Street, Los Angeles, California that I was arrested by the Holy Ghost and gave my heart to God. This was the first time I had been in a church service since a small boy, nearly 44 years before. My criminal life began when I was 14 years of age back in New York as a pickpocket. I had Christian parents and a lovely home. My father was a practicing physician. They did all they could for me but the devil got hold of me in some way, and I seemingly could not keep from doing wrong. They sent me into the country, but I did no better there. I overheard them talking of sending me aboard the Schoolship St. Mary, and then I ran away. I drifted westward, and in 1876 joined the James’ gang with the Younger Brothers, and was with them in the Northfield Robbery. I escaped the vengeance of the law, and made my way to Omaha, Neb. I had served three terms of one year each behind prison bars. In 1900 I was convicted of a crime and sentenced to life-imprisonment. When those doors closed upon me it was terrible; no one can know my feelings but those who have passed through such an experience. It was a life of torture; a living death. On the 19th day of March, 1913, I got my release from prison, and friends took me to the state of Washington, where I found employment in a lumber town. I did not like it, however, and soon found a friend who gave me work for two months; but when he came to me one day and said that he could not employ me longer, I knew my past had been revealed, and became discouraged. At last I gave up trying to be good! I found it impossible, and determined to go back into my old life of crime. I knew it meant death to me, so I began to prepare for what I knew in the end would be the taking of life before they would get me. I was desperate, and once more the old outlaw spirit was upon me and I was becoming a demon at heart. I went to Tacoma and Seattle and looked up some of my old pals – men who did not care for their lives. With them I planned to go back into my old work of train robbing. I came to Los Angeles on the 19th day of July, 1913, and began to look up this country, both along the Santa Fe and Southern Pacific railroads, preparatory to “striking” and then striking again. I went into the mountains for a month, in the vicinity of what is now known as Pisgah Grade, and drew my maps and laid my plans. I came back into the city and put my men (as they had bad records and were wanted by the police) in hiding. The night before the intended robbery I walked down Main Street, thinking over my plans and the course mapped out, when I found myself in front of a mission. Just then I saw a policeman coming down the street and naturally feeling suspicious, I stepped inside to avoid him and walked way up front. I did not hear much of the service, for my mind was upon the work for the next day. I felt a little uneasy, for I had left my suitcase in my room, and in it some of the “soup” (nitroglycerine), some high explosives, and my guns. I had everything ready and so far my plans had gone smoothly; but as I say, I felt worried, and was just getting up to leave when one of the workers came to me and asked me to give myself up to God. The life I had lived did not allow me to believe in a God. I do not remember his reply, for when I attempted to get up I had no control over my legs. I do not know what you think, but I know my legs were fastened to that floor by a power not of this earth. I kept trying to get up, when a woman came and sat down beside me, and urged me to go up to the altar. I listened to her pleadings for a time and then consented to go, thinking it would do me no harm anyway. What seemed so strange to me was that I did not have any power to resist. It was not the woman, for I had been a woman-hater since my early life; it was the power of God. As soon as I gave my consent my legs were released, and I went up and knelt at the altar. I heard them praying, and a strange feeling came over me. It seemed as though something in my heart was loosening up, and I began to feel happy; then a warm light came from above and made my whole body burn. How sorry I began to feel for my past life of crime! I could not keep back the tears – tears of real repentance. I heard them tell me to repeat a prayer, but I had found the Lord before that. Oh, what a joy came into my heart! That heart of mine was as hard as stone; nothing had ever melted it, and my soul was black with many a crime, but the Lord took me and washed me as white as wool. There is nothing but the power of God that can take the wickedness of life out, and keep it out. During all my life I had walked in the valleys and through dark paths, until up from the depths below He lifted me out – of darkness into His marvelous light. I know that a man who has lived the life that I have can never reform, but through the power of God he can be transformed and given a new nature; it’s the birth of a new spirit. I would not take the whole world for the joy the Lord gives me. I broke my mother’s heart, and sent her to her grave in disgrace. A dear old father and sisters and brothers have all passed away, and their last thoughts were of me. I think I can see them now, their faces shining with the glory of God as they look down upon me from the glory-world beyond the skies, and rejoice, for “He that was dead is alive again, and he that was lost is found.” Now in place of carrying guns to destroy life, I carry the Word of God that gives life – eternal life. There is no such thing as reformation for one like me. It takes the power of the Blood of Jesus Christ to blot out transgression and clean one up. Nothing else can take away our sinful appetites and set us free from the power of the evil. He that is free in Christ Jesus is free indeed. I have had repeated offers to go back into the old life since my conversion. Men have even offered to supply the money for necessary outfit or equipment. But it was the strength that I got from God alone that helped me to stand. Note: After twenty-four years of a victorious life Bill Stiles recently passed to his eternal reward. His friends who were present the night he was saved and knew him intimately all during his Christian life, witness to the fact that he served his Heavenly Father faithfully to the end. – Ed. It begins simply enough: as part of the ongoing project to document the forgotten history of Downtown Los Angeles, our present aim is to blog about a series of previously-unknown documents from archives of the Union Rescue Mission (URM). We will begin by sharing some of the testimonials of faith made by those “saved” by the mission’s outreach. Each of these testimonials tells the story of a life run off the rails then back on again, and offers insights into fascinating historic subcultures which are infrequently documented. We will also be presenting photographic documentation of the early buildings which housed the URM. These now-demolished sites will be placed in their historic and present-day contexts, to fill in some of the gaps in the century-long history of Downtown Los Angeles as a zone of poverty, addiction, redemption and transformation. Along the way, we will introduce some of the interesting individuals whose work at the URM contributed to its mission, and uncover aspects of forgotten social history which were documented, sometimes inadvertently, by URM staff. The URM exists to rescue men and women who have been utterly abandoned and become discouraged and helpless. It seeks to bring the gospel of Jesus Christ into their hearts, which will lead them out of temptation and to salvation. Within this lofty intent sits the more earthly goal of feeding and clothing the poor in areas which historically have been blighted, and giving them tools by which they can improve themselves. Very quickly we already have two distinct aims by which we can distinguish and give context: that of public policy and that of Faith. These two aims cleave the problem space neatly into two parts: 1) the finite, delineated by its limited resources, clothes, energy, food, land, and those in authority who can allocate them, and 2) the infinite, that small, intangible part in all of us which is the gatekeeper to something bigger, delineated by its resources without limit: love, charity, compassion, strength. Those in authority have absolutely no control over the quality, quantity or allocation of these infinite resources. Attempted solutions for improving the hardships faced by the poor are manifold in Southern California. They range from the official Public Policy for the County and the City of Los Angeles, Upton Sinclair’s EPIC movement, Job Harriman‘s Llano del Rio commune, the URM, and Sister Aimee Semple McPherson‘s Four Square Gospel. Note that of the solutions just listed only the first two are political, one is an attempt at a utopia, and two others come out of a literal reading of the gospel of Jesus Christ. While the notion of a solution straddling the two kingdoms – one which feeds the stomachs and the souls of the masses – may seem fanciful, those leaders who have been most effective over the past century have had their feet planted firmly in both. To start our exploration of the URM and the significance of its work in Downtown Los Angeles, let me lay out some important milestones in the form of dates and locations which will be helpful in understanding the context as our work begins. Operating under the name Pacific Rescue Mission, Col. M.C. Mason, since 1894 the superintendent of the Mission, rents a building (address unknown) at 2nd & Main in which to continue their good works. Beginning in 1891, the Mission work had gone on under temporary canvas tents in the area, and on the iconic gospel wagon which traveled up and down Main and Los Angeles Streets, 1st and 2nd Streets, stopping at the many saloons along the way seeking penitent souls who wished to “go on the wagon” and dry out. The only director listed in both the 1891 annual report and in the report for 1896 is Lyman Stewart, founder and president of Union Oil. His influence will be felt over the URM for decades. Under Col. Mason’s successor, Mr. Jeffreys, a hall is rented at 145 N. Main, on what is today the lawn of City Hall. It continues to operate under the name Pacific Rescue Mission. The Mission’s core outreach with their gospel wagon is curbed, as city ordinances are passed prohibiting street oration for the areas around 2nd & Los Angeles, and all area speaking permits are rescinded by the LAPD as well. These rules reflect the city’s public policy to curb the activisim of the emerging labor movement, with an unexpected side effect of curtailing the Mission’s work in the saloon district. After almost a decade of operating the ground floor hall in this narrow, two-storey building sandwiched between two saloons on a street of pawn shops and electric photograph parlors featuring various racy entertainments, the Mission purchases outright the building at 145 N Main, demonstrating its commitment to continued outreach to the community. 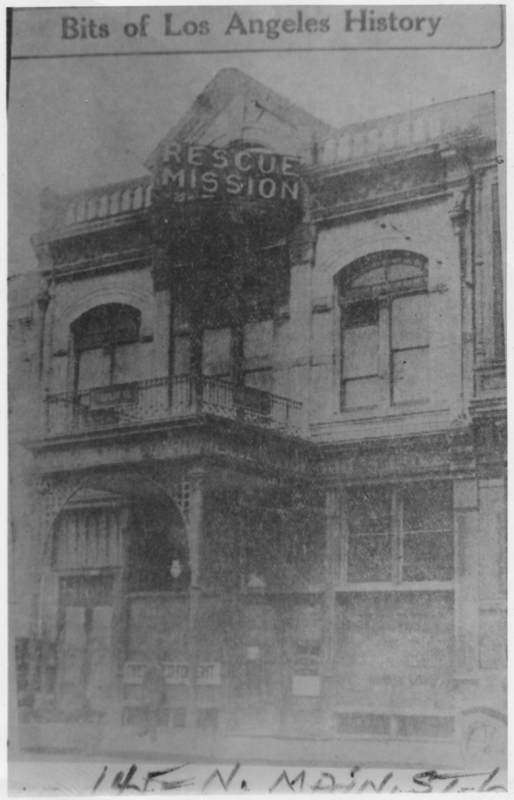 On January 23, 1908, The Union Rescue Mission is incorporated as a California Public Benefit Corporation. Union Oil’s Lyman Stewart sits on the board of directors. On February 25, 1908, Bible Institute of Los Angeles (BIOLA) is founded, with Rev. T.C. Horton as President. Horton had been on salary at URM for two years as an assistant pastor in charge of bible teaching. Lyman Stewart of Union Oil will be BIOLA’s principal benefactor, giving the institution over a million dollars in his lifetime. In addition to being the principal financier of BIOLA’s 1914 Italian Revival auditorium and Bible college at 550 South Hope Street (behind the Central Library), Lyman and his brother Milton would at the same time sponsor, at a cost of several hundred thousand dollars, the publication of the 90-chapter volume of scriptural study “The Fundamentals,” sent free to Christian workers all over the world. The City of Los Angeles finalizes its seizure by imminent domain of 145 N Main in preparation for groundbreaking on the new City Hall. With just weeks remaining before the URM must vacate, new quarters are secured just to the south at 226 S Main, next door to the Cathedral of St. Vibiana (1876). The City of Los Angeles passes a $5 Million bond measure to create a much-needed work relief program. Although 16,000 jobs were created, the program was seen as inadequate by critics. Los Angeles Supervisor John R. Quinn believed that there were 200,000-400,000 non-citizens living in California. If local governments could only get rid of those free-loaders, he believed unemployment would no longer be a serious issue, and crime rates would plummet. Charles P. Visel, Director of Unemployment Programs for the city began to explore the option of deportation as a solution to unemployment. The Los Angeles County Welfare Bureau used up its entire fiscal appropriation in April. Its director requested more funds, but was denied. Upon his announcing he has no choice but to to close the department, the Board of Supervisors comes up with $250,000 to keep it afloat. Meanwhile, the URM considers merging with BIOLA at the direction of some of BIOLA’s supporters, but ultimately the URM board resolved the issue by recognizing that the Mission is well adapted to its location on Main Street, and would best continue to serve its soul-saving purpose there. It is estimated that 344,000 people are unemployed in metropolitan Los Angeles. The city has an $11 million deficit, and appears to be out of money and ideas. Civic leaders begin to warm to the notion that the destitute should be kept out of Southern California. City Council passes an ordinance forbidding begging on the streets of Los Angeles. The LAPD begins to meet incoming freight trains in the city’s rail yards. The Los Angeles Chamber of Commerce recommends that the National Guard be stationed along the State’s borders to keep out undesirables. Independent of any particular location or points in time are two last important concepts: the notion of Skid Row itself as a neighborhood which has always had a rapidly changing demographic and numerous forces at work in its shaping, and the rise of Urban Redevelopment as public policy. It is estimated that only about 5% of the homeless in Los Angeles occupy the roughly 50 square blocks of what is now known as Central City East (Skid Row). It is that concentration in such a small area which helps create the area’s unique characteristics. Skid Row is demarcated to the east by Alameda, to the west by Main Street, to the north by 2nd, and to the south by Olympic. Post-1945, public policy in the City of Los Angeles changes dramatically. The creation of the Community Redevelopment Agency in 1949 will become the rock upon which Urban Redevelopment is built. This agency, an autonomous taxing authority, is charged with the dual—and conflicting—goals of commercial revitalization of blighted areas and the creation of affordable housing. The CRA will be the major force driving public policy in Skid Row from the 1950s through the present day. The policy of geographical containment of the disenfranchised, the formation of housing trusts, and the 1992 relocation of the URM to its current location at 6th & San Pedro, all are the work of the CRA. So get ready to discover the unwritten history of the Union Rescue Mission, Skid Row and Downtown Los Angeles. We’ve created a visual template to distinguish the posts which comes out of our work on the URM archives from other material presented on the In SRO Land time travel blog, and will be providing an RSS feed and a single link to the site to point interested visitors directly to the URM material. Finally, we must express our debt of gratitude and thanks to the staff of the Union Rescue Mission, particularly to Liz Mooradian, the self-selecting keeper of the archives, and to the Mission’s CEO, Rev. Andy Bales. It is due to their support of this project and belief in the historical value of the URM’s archives that we are able to share these extraordinary documents with you now.